I should not like “Don’t f**k it up”. Just because I am not a big fan of “how to” books in high-tech entrepreneurship. There is another reason why I should not like, i.e. 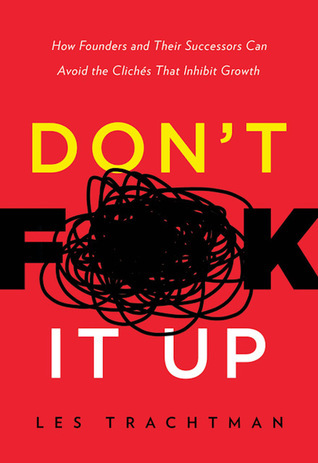 the subtitle: “How Founders and Their Successors Can Avoid the Clichés That Inhibit Growth”. Usually I think foudners should not have successors. But I did not hate les Trachtman’s book at all. The reason is Les gives good advice to founders, the main one being “Trust and Empower”. 2. Decide what not to work on, and stick to it. 4. Write down your goals and revisit them quarterly. This entry was posted in Must watch or read and tagged Entrepreneurship, Founder on September 12, 2017 by Hervé Lebret.